I did not realize the importance of a detox until I actually enrolled myself into a program that allowed me to flush out the toxins. Comfort eating had helped me put on oodles of weight and I didn’t bother worrying about it until the detox program caused me to lose weight—and I realized that I was leading an unhealthy life. Maintaining the lifestyle post-detox session required me to be strict about my diet and food intake. If you are one to reach out for that cup of coffee as soon as you wake up, it is time to make a healthier choice. My lifestyle took a healthy change when I swapped a healthy detox drink for the cup of coffee. 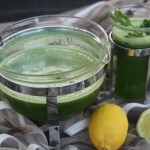 These simple detox drinks can be made at home with the freshest ingredients available and trust me, they hardly take any time. We have had innumerable posts on the benefits of this drink. This one by far is one of my favorite drinks. Drinking lemon and lukewarm water in the morning has immense health benefits that include flushing out toxins, building up the immunity levels, aiding in digestion and making us look good! 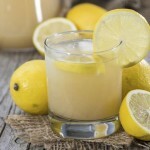 All you need to do is squeeze the juice of half a lemon into into two cups of warm water. Add a dash of honey and drink this every morning on an empty stomach. 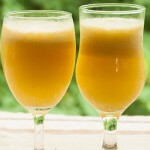 With the summer setting in and the temperatures soaring, I love to drink something refreshing and cool in the mornings. This easy to make drink can be stored for a day and consumed all through the day. 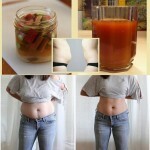 Take a large jug and add in about 1.5 liters of water. Add a cup of diced watermelon, one cup of cubed cucumber ( with the skin) and a sprig of mint leaves. Let this steep overnight in the fridge and it is ready to consume the next day. This nourishing Ayurveda drink can be consumed any time of the year. This wonderful drink not only helps to flush out the toxins from the body but it also helps to to keep the cough, cold and flu at bay. 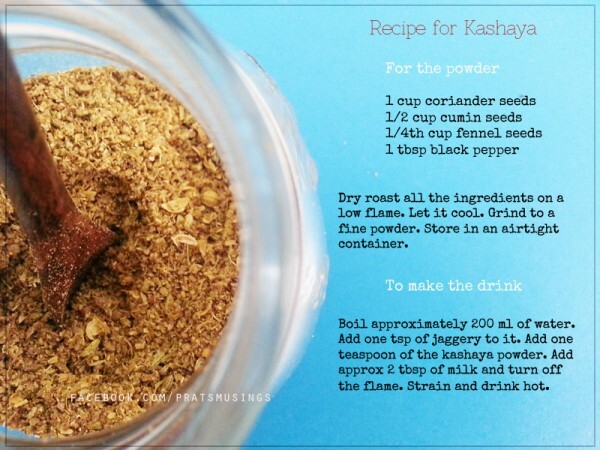 The recipe is mentioned in the image and you can store this powder for up to two months in an airtight container. Staying healthy is a choice that we have to make. Building up your metabolism and getting a better immunity is a choice that will help us in the long run.